The AFCI, arc fault circuit interrupter, AFCI, is an electrical component designed to protect against fires caused by arcing faults in the home electrical wiring. More than 40,000 fires are attributed to faulty home electrical wiring. One of the major causes of fire are the arcing faults, causing high temperatures that can propel fire on different materials such as wood, paper and flooring material. This type of problem occurs mostly in damaged or defective wires. Defective wires can be caused by picture hanging, poorly installed outlets, or puncturing of wire insulation. Breakers installed throughout the years only protect from overloads and short circuits; leaving system unprotected by arcing conditions that produce erratic current flow. An AFCI actuates only to selective incidents so that normal arcs do not cause it to trip. Arc fault circuit interrupter uses unique current sensing circuitry to recognize between normal and unwanted arcing conditions. If an adverse arcing condition is detected, the control circuitry in the arc fault circuit interrupter trips and shuts off the electric current reducing the potential of a fire to occur. The AFCI should not fail during normal arcing conditions, which can occur when a switch is opened, or a plug is pulled from a receptacle. They are designed into conventional circuit breakers combining traditional overload and short-circuit protection with arc fault protection. AFCI circuit breakers have a similar look to a ground fault circuit interrupter, with a test button. Some designs combine GFCI and AFCI protection. Arc fault circuit interrupter will not eliminate the possibility of arcing faults, but they will reduce the risk of occurrence. Sometimes the initial arc may cause ignition prior to detection and circuit interruption by the AFCI. The AFCI will also protect the system from overloads and will also provide limited protection for power cords and extension cords. AFCI’s are required on circuits containing the outlets in bedrooms and limited to new construction only. However, it is a good practice to install them in existing residential units also. Older homes with aging and deteriorating wiring systems can especially benefit from the added protection of AFCIs. 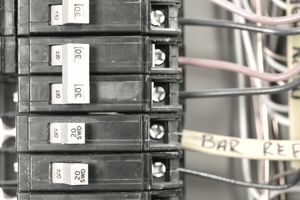 AFCIs should also be considered whenever adding or upgrading a panel box while using existing branch circuit conductors. As of January 2008 only "combination type" AFCI's will meet the NEC requirement. The 2008 NEC requires the installation of combination-type AFCIs in all 15 and 20 amperes residential circuits except for laundries, kitchens, bathrooms, garages and unfinished basements. These types of breakers should be tested at least once a month to make sure that they are working properly. If the device does not trip when tested, the AFCI is defective and should be replaced. Although they are very similar in appearance, AFCI only provides protection from fires caused by arcing faults, while the ground fault circuit interrupter (GFCI) protects people from electric shocks. The GFCI also can protect against some electrical fires by sending arcing and other faults to ground but cannot detect hazardous across-the-line arcing faults that can cause fires. A ground fault is an unintentional electric path diverting current to ground. The National Electrical Code requires GFCI protection for receptacles located outdoors; in bathrooms, garages, kitchens, crawl spaces and unfinished basements; and at certain locations such as near swimming pools. A combination of AFCI and GFCI can be used to satisfy the NEC requirement for GFCI protection only if specifically marked as a combination device.